Opened in February 2011, Lukshon is a modern restaurant dedicated to traditional and creative Southeast Asian flavors, created by one of L.A.’s most celebrated chefs – Sang Yoon. Named the #4 restaurant in Los Angeles from venerable food critic Jonathan Gold of the Los Angeles Times, Lukshon showcases a menu of bright and flavorful dishes that celebrate the wonderfully diverse ingredients of Southeast Asian cuisine. To pair with the bold flavors of the menu, Lukshon highlights a concise and well-curated selection of wines, along with rare and unique beers, both bottled and on draft, and a thoughtful craft cocktail program that integrate Southeast Asian influences. Guests are presented with a variety of dining settings, ranging from the expansive bar that looks into the open kitchen, intimate outdoor patio, elegant booths, and sleek communal tables. Every aspect of Lukshon is crafted with incredible attention to detail, from the expertly plated dishes, to the unique furnishings, and impeccable service. Sang Yoon is the chef and proprietor of Father’s Office gastropub and Lukshon restaurant in Los Angeles, California. Yoon began his career in fine dining in Michelin-starred kitchens of Paris, New York, and Los Angeles including work at Chinois on Main and later as executive chef of Michael’s, Santa Monica’s famous dining destination for contemporary California cuisine. In 2000, Yoon struck out on his own by renovating his favorite local dive bar, Father’s Office, where he trailblazed the gastropub movement in L.A. and beyond. Father’s Office is critically and popularly-acclaimed for its signature craft brew selection of over 55 local and small-batch varieties and the proprietary “Office Burger” has been hailed as the country’s best burger by the TODAY show and Esquire magazine. Yoon has been profiled as a craft beer expert in USA Today, Food & Wine magazine, and National Public Radio and has been featured as a guest judge on Bravo’s Top Chef and competing chef on Top Chef Masters. 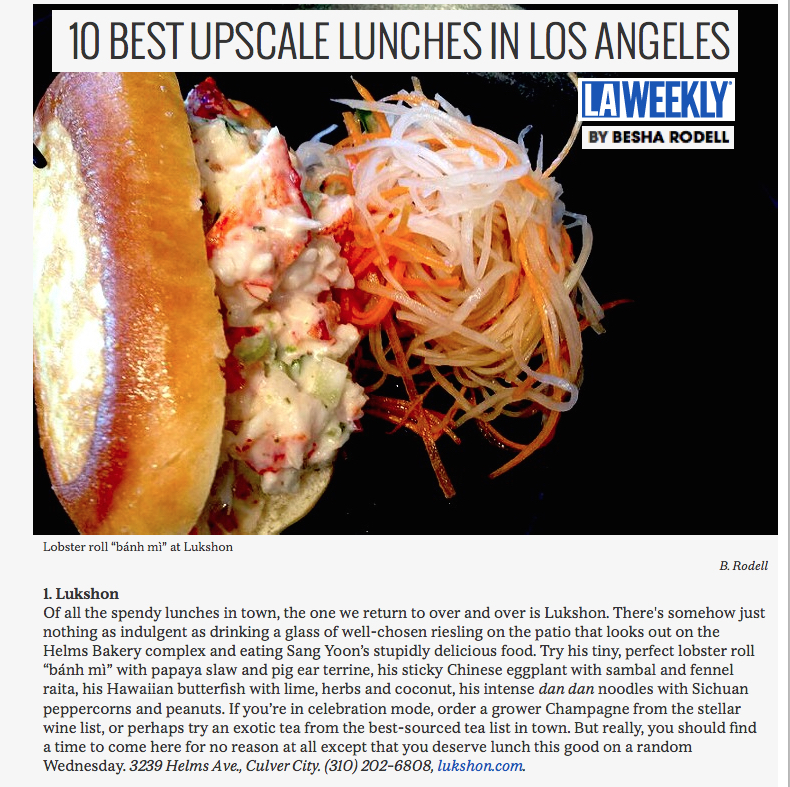 February 2011 saw Yoon’s return to fine dining with the debut of Lukshon, a modern restaurant dedicated to traditional and creative Southeast Asian flavors that was recently named the #3 restaurant in Los Angeles from venerable food critic Jonathan Gold of the LA Times. In June 2016, Yoon opened Two Birds One Stone, a restaurant project in California’s wine country alongside chef Douglas Keane. Yoon credits the loves of his life—champagne and hockey—with helping him to achieve an ideal work/life balance.